It is so great to see the appreciation for compositions and transcriptions by Eugene Ysaÿe - I was fortunate to hear about Ysaye's live performance in Kassa/Kosice, still in the "old" Hungary, perhaps in the 1930's, from my father, who had been a student of Jenö Hubay in Budapest. Because of this, I also developed a great interest in the music by Ysaye and was probably the first to perform his Solo Sonatas in Hungary. Actually, when looking for the music, I found only one, the No. 6 in the library of Franz Liszt Academy (1974) and soon after we ordered all six, in those days still from outside the iron curtain. Later in Canada, I was the leader of a string trio and discovered his Trio "Le Chimay", available only as a facsimile of his handwritten parts. We performed this 1996-97 as premiere performances in Canada, playing from score and parts I had prepared with Finale. However, Schott Freres declined to publish this, since there was apparently no interest at the time. I still continued to work on other chamber pieces by Ysaÿe, performing works such as the "Exil" for string orchestra and the Sonata for two Violins, which I recorded and prepared good copies. I also found a manuscript copy of all three movements of the Trio "Le Londres" for two violins and viola, which he had based on the Duo Sonata. Around 2005, Schott had published my edited version of the string trio "Le Chimay" and was interested in publishing my edition of the trio "Le Londres", which I also recorded as a world premiere performance with principal players of the Mozarteum Orchestra Salzburg. Here is that recording: Ysaÿe Le Londres CD. I have now prepared a revised edited copy of the Trio "Le Chimay". Sheet music is available here: iStrings sheet music catalog. April 25, 2017 at 05:27 PM · Nandor, what was your father's impression of Ysaye's playing? Did he describe it to you? April 26, 2017 at 05:40 AM · wow Nandor! This is amazing work! I was actually wrong with the possible date when my dad heard him playing; I just did a quick research and I believe it must have been around 1920 because it was after WWI but my dad left Kosice around 1925. As my father learned to play the violin because he found one in the attic of their house, it was perhaps the biggest event ever for him when after the war, when life was starting to be back to normal and so he attended every concert they had there. I am not sure where was this concert, maybe already in the former synagogue where the Kosice phil plays still, (I played Brahms double once also there), but it was a hall with stage. He described it so that everyone in the hall was surprised to see nothing else but a huge armchair in the middle of the stage, and when Ysaÿe came in they were even more surprised. He said, it was a bit odd, to see this big man slowly come in (actually he said "rolled" in - in Hungarian we compare big people very unrespectfully to a ball) with his tiny violin and made himself comfortable in that chair. Even he asked himself if this guy would be able to play at all. But as Ysaÿe started to play, there was suddenly - as he explained - electricity in the air, people were simply amazed, and so for my dad this was one of the most wonderful memories in his life. Ysaÿe played only solo, Bach and his own works unaccompanied. 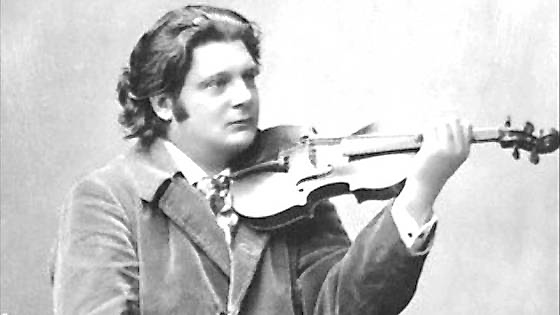 Unfortunately I don't remember more details or my dad didn't tell me more, but he was a big Ysaÿe fan for all his life, and proud that he could study with Hubay, another former pupil of the great Belgian violin school. April 26, 2017 at 11:37 AM · What a fabulous piece! Ysaye is amazing, like the other great violinist, Enesco. Beautiful performance! April 26, 2017 at 03:38 PM · What an impression! And that he could command such attention, playing all solo works. April 29, 2017 at 04:18 PM · Nice one! If it was after 1918 when Czechoslovakia originated, it wasn't old Hungary anymore but in Czechoslovakia where the concert took place. Great violin work from Yasaye.